H., Thomas (2005) Pengaruh musik klasik karya Wolgang Amadeus Mozart terhadap kemampuan mengingat jangka pendek pada remaja. Skripsi thesis, universitas Tarumanagara. 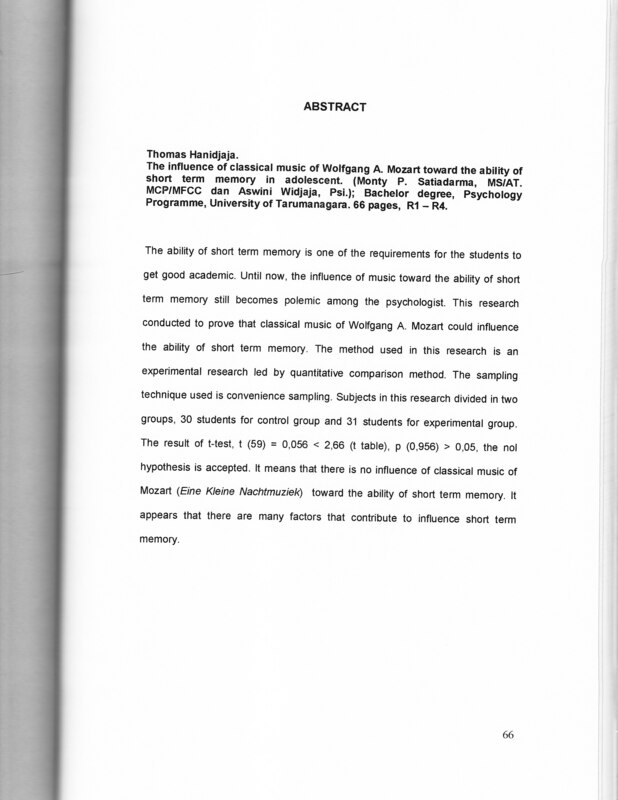 "The ability of short term memory is one of the requirements for the students to get good academic. Until now, the influence of music toward the ability of short term memory still becomes polemic among the psychologist. This research conducted to prove that classical music of Wolfgang A. Mozart could influence the ability of short term memory. The method used in this research is an experimental research led by quantitative comparison method. The sampling technique used is convenience sampling. Subjects in this research divided in two groups, 30 students for control group and 31 students for experimental group. 3 The result of t-test, t (59) = 0,056 < 2,66 (t table), p (0,956) > 0,05, the nol hypothesis is accepted. It means that there is no influence of classical music of Mozart (Eine Kleine Nachtmuziek) toward the ability of short term memory. It appears that there are many factors that contribute to influence short term memory. "